We planned most of our wedding on our own, but we decided to hire BTS for the last month before our wedding, so that "someone else" would be there to worry about "the stuff" leading up to and on the big day. BEST. DECISION. EVER. With knowing the grand vision I wished for on my wedding day, a wedding planner was an absolute requirement. 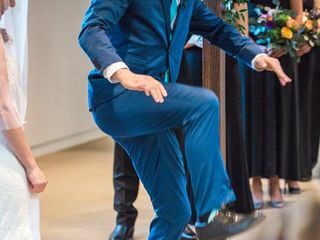 I desired an event coordinator that would provide me with various options, push the envelope, and always strive to ensure that my wedding would be everything I dreamt of and more. With BTS Event Management, you get two creative minds. Trista and Alex are not only extremely passionate about their jobs, but they work wonderfully together and are truly a dynamic duo. They were there along every step of the way. Whenever I required reassurance, they were never more than a phone call, text message, or e-mail away. If you are looking for an event team that will take your vision and bring it to the next level, you cannot go wrong with BTS Event Management. Alex and Trista are amazing! They helped me transition my wedding from one vision to the next. And made our day amazing! BTS was absolutely amazing every step of the way! My family and I agree that the best money we spent on the wedding weekend was having Alex and Trista as our planners. They helped bring my ideas to life and by far exceeded my expectations. My wedding was more beautiful than my wildest dreams thanks to the creativity of both Alex and Trista. My wedding day was so much fun and I never experienced any stress because I knew the BTS team was there to handle my timeline and help everything go smoothly. I cannot recommend BTS enough, not only are they incredibly sweet and easy to work with, but they truly know how to bring wedding dreams to life! Working with BTS was a true pleasure! Alex and Trista did an amazing job honing in on the vision my wife had for our big day. They introduced us to amazing vendors, organized visits, attended every vendor meeting, and above all ran everything perfectly the day of. They thought of and handled so many details we hadn’t even considered and were truly magic behind the scenes ensuring our day was everything and more. Trista and Alex were always responsive and attentive to our needs and requests. They gave my wife the wedding of her dreams and we can’t thank them enough. I was skeptical of spending the money on a wedding planner when my wife brought it my attention but it was definitely money well spent. They were great!!! Would recommend to anyone that wants an amazing experience!!! Thank you ladies?? Using BTS Event Management was the best decision we made. 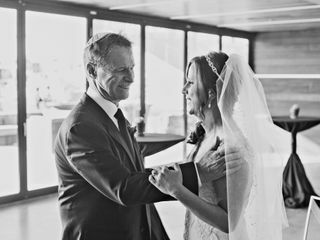 My daughter's wedding was a destination wedding for us and we could not have planned it without the help of Trista and Alex. They were there for us every step of the way and made the whole planning experience for us pretty much stress free. They did so much more than I thought. They took our vision and made it a reality. When we asked for advice about certain things they were very honest and it was always the right advice. The vendors they chose for us were fabulous. They understand every detail of a wedding. The whole wedding weekend was amazing and myself and my family was able to fully enjoy everything and everyone. I would highly recommend using them. Trista and Alex of BTS Event Management are wedding planner gods. After interviewing multiple wedding planners over the phone with no luck, I spoke with Trista. Her passion, expertise, humor, and confidence radiated over the phone. I knew I had to have BTS for my wedding. We worked with Trista and Alex for over a year planning our wedding. They were there during the whole planning process. 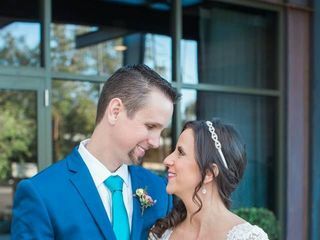 They visited our venue multiple times which was in Nogales, AZ (3.5 hours south of PHX) we texted, emailed, and chatted on the phone - they were always there for me. The wedding was out of state at a family property. This meant we literally had to outsource everything. There was no detail forgotten by Trista and Alex- they thought of everything. The wedding was so seamless and perfect. Trista and Alex both have exquisite taste, which makes things so much easier. They truly understood and enhanced my wedding vision. My jaw dropped to the floor when I saw my reception. I still get chills thinking about the beauty of it. Above all Trista and Alex are so down to earth, I consider them to be more than my wedding planners, they turned into my friends. Our wedding wouldn’t have been what it was without them. Don’t hesitate, do the best thing for your wedding and hire BTS!! Alex and Trista made my day absolutely perfect and seamless. Their knowledge, eye for detail, ability to organize, and direct people made my day truly the best day ever! I can't thank them enough for there professionalism, kindness, and making my day so beautiful and stress free. You two are the best!! For a girl who thought she can do it all, I couldn't have done any of this without BTS. They were so responsive, and helpful throughout the process. They've done hundreds of weddings prior to mine, and countless after, but I felt like the only bride they were dealing with. Which, lets be honest, this is an experience of a lifetime and you want to feel like the only one--even though you may be one of many. There's one moment in particular that made them stand out. Half way through the wedding right when dinner was served and prior to digging into the first bite, we had a line beginning to form at our table to talk to my husband and I. We hadn't sleep the night before, we hand't ate all day, and all we really wanted to do was soak in the moment and enjoy each others company. Without even asking, Alex and Trista came to save the day. They walked up to the line and politely asked everyone to give us a moment alone. This small act of awareness and kindness meant so much to my husband and I. They were by far one of our best wedding decisions. I recommend them to everyone! The venue we ended up selecting required that we have a day of coordinator and I am so glad that we got one. I was reluctant because I am a perfectionist that had a precise vision of exactly what I wanted things to look like the day of. As hard as it was, it turned out even better than I imagined! 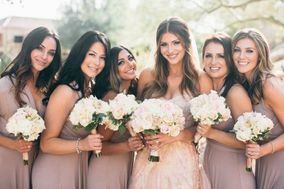 I could relax with my Bridesmaids the morning before the wedding and knew exactly what to expect on when vendors would come and exactly how long it would take for them to do things. We were able to get recommendations for things that we didn’t even think of and make sure that every detail was covered. Even though they were a day of coordinator, they were fantastic at helping me with every detail along the way and made sure that I was not stressing last minute with the vendors to make sure they knew when and where they were going. There were some instances during the reception like MIL drama and drunk Uncles but Jessica handled everything so professionally and before I even noticed. She made sure that everything at the reception was timed and kept things moving. We were able to enjoy the night with friends and family rather than worrying about when to cut the cake or toss the bouquet. I honestly don’t know how I would have done it without them and am so happy that I was able to enjoy the day and the night without any stress or worries or problems. They always say that something will always go wrong at a wedding and no one will notice, but I can honestly say that everything went perfectly and am so thankful that we hired them. I couldn't be happier with the services provided by Alex. Planning a wedding is stressful especially when you've never done it before. Alex was available every time I had a question and had a top notch list of vendor to work with. I really could not have had the wedding of my dreams without her. Trista was wonderful too! Stepping in when Alex was busy, these girls didn't miss a beat. I would highly recommend them for any party! We're still getting compliments on who much fun and how gorgeous our wedding was! Alex and Jessica were amazing! Hands down the best money spent on our wedding day. Alex made herself available for months before the wedding helping with anything I needed. They both went above and beyond to make sure everything ran smoothly. Jessica even helped come up with a way to fix my bustle when it ripped out after getting caught on the stairs. These ladies are so sweet and wonderful...highly recommend! We bought day-of coordination, but received so much more than what I originally expected. While we selected our vendors for flours, venue, photography, music, etc., Alex managed all contracts and kept everything on track. Both of the bride's parents are project managers, and Alex was really funny when she would come over and nicely tell us to go have a good time - she'd already taken care of it (whatever it was). I have twins who both married this year. I truly wish Alex had been around for the first wedding. Almost makes me wish for triplets just to use BTS again for a wedding. Happy, happy mother of the bride. Thank you Alex, Jessica and Trista. I highly recommend you and wouldn't hesitate to use you again. But the triplet thing was really a joke! BTS was recommended to me by my wedding photographer and what a wonderful recommendation it was! After the first meeting, my husband and I new instantly that this is who we wanted to entrust our big day to. Alex and Trista were extremely knowledgeable, personable and had some wonderful ideas for our wedding. They also had extensive knowledge of our wedding venue, L'Auberge de Sesona, which was a bonus! We hired BTS for day of coordination, which included so much more than just day of coordination. We had unlimited communication with Alex and Trista before our wedding day, which many other planners do not provide when you hire them for day of coordination. They made sure we were organized, helped create a great wedding timeline and provided us with their industry knowledge. They gave us peace of mind the week before the wedding because I knew everything would be taken care of on our wedding day. Do not underestimate how wonderful it is to have peace of mind the week before your wedding when all your family and friends start arriving! Our wedding turned out absolutely beautiful and everything ran so smoothly. We know they worked incredibly hard the day of to make sure everything was in place and running on schedule. Our only regret is that we didn't hire them sooner in our wedding planning process. BTS has the knowledge to make wedding planning much easier. Hiring them was one of the best decisions we made during wedding planning and we can't recommend them enough! You won't regret booking with BTS! Alex and Trista go above and beyond to make sure their brides can rest easy. They added tons of very special, additional touches that blew away our expectations (even though we already expected the best!) They are so talented, organized and professional. Every guest at our wedding commented on the beauty and perfection, we feel so lucky to know these awesome women! Thank you, BTS!!! 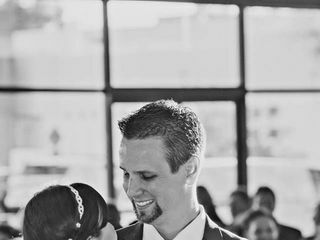 My husband and I retained BTS Event Management as day-of-coordinators for our wedding day and it was one of the best decisions we made when planning our wedding! BTS Event Management came highly recommended by our venue and I can understand why - they made sure all of the details that my husband and I had been envisioning and planning for months leading up to the wedding come together. They made sure all of the photos, details and other events that we wanted happen and kept the wedding flowing beautifully. On our actual wedding day, both my husband and I were able to enjoy being at our wedding rather than having to worry or make decisions about flowers, the band, placecards, locate family members, etc. because they took care of it! 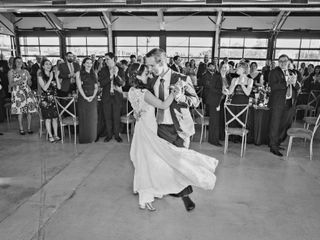 We feel very lucky to have been able to enjoy our wedding day and partake in the celebration because we are certain that without Trista and Alex it would have been a different experience. Trista and Alex are wonderful people, incredible resources and they worked wonderfully with our venue. 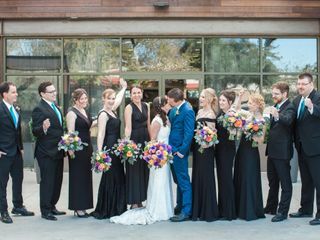 We highly recommend BTS Event Management and both Trista and Alex - they helped to make our day so special! BTS, specifically Alex, did an amazing job planning and executing our wedding! They were very responsive to emails, texts, and phone calls and I was able to reach them at practically anytime of day. They helped me relax and erased all of my concerns and stress as a bride can sometimes get when planning a wedding. 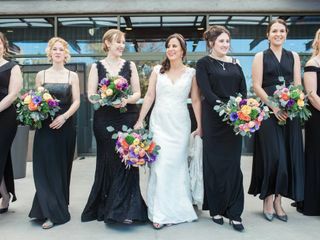 They were very professional as experts at their trade, but also very personable and I feel I truly had a friend by my side throughout the wedding prep and planning process. On the actual wedding day they thought of everything, even down to the smallest detail of providing chapstick for the groom. haha. I would highly recommend BTS for any and all event planning needs! Trying to decide on who to use as a wedding planner can be confusing and call me crazy, but hard work! You have to make sure personalities fit with your own and the planner(s) have the same vision as you or know Exactly what it is YOU want for your special day! Trista and Alex did exactly that for me and my husband. We were trying to plan a wedding from out of state which was stressful enough! Trista and Alex really came through and helped design our wedding exactly as we hoped for! They gave lots of great advice/vendors for research and bounced off ideas...especially when it came to trying to stick within our budget. That was huge!! Trista helped tremendously with great ideas of staying within our budget letting us know certain things won't make or break the wedding and where to put a little more or a little less. They have a great eye for all of these things and their help was appreciated more than they know!! They were always VERY responsive to all of our emails, calls, texts; incredibly accommodating and flexible throughout the entire process. I can't say enough great things about these ladies and the work they do. I have to imagine doing this day in and day out isn't the easiest task, but they do it with such passion and heart. They were completely there for us and always want to make sure we were happy while going through the planning. Their design skills are beautiful, and we were totally awed and floored with the end results! :) I'm going to miss working with them and will highly recommend them to friends in the future! :) Thank you thank you for making a truly memorable and beautiful day for us!! BTS provided exceptional service during a very chaotic time. Half way through planning my wedding, I relocated to NYC. I was fearful that this would put a damper on planning the perfect wedding, but Alex and Trista took full control and the process was seamless. Whenever I would second guess something, both ladies were there to step in and reassure me that everything was going as planned. The venue I selected had "no fireworks" in their contract, but after some convincing the contract was modified. I couldn't have selected a better planning team. BTS made the wedding of my dreams come to life. Trista and Alex are truly amazing at what they do! My wedding so beautiful and they really put so much effort into making every detail of the entire day perfect. They were so organized and prepared that I was able to just relax and really enjoy the experience of my wedding day. They were with me throughout the entire planning process for a whole year and were so responsive and caring with every interaction. I would definitely recommend them for wedding services! I love Alex and trista. They are a beautiful blend of professional and fun. Would use them a hundred times over! They made my day so easy and blissful! We decided on a destination wedding and were married at the Phoenician in Scottsdale. Since we live in SF we were worried about planning a wedding with our busy jobs and also since we were so far away. We decided to start looking around for planners and after interviewing a few of the larger companies and checking references we realized we needed someone who was upfront and very responsive in order to make it happen. We were lucky to work with Trista and Alex! We only had to go onsite once before our big day after we picked the venue and they were super responsive over the few months we worked with them. Their ability to make all the vendors come together to really exceeded our vision was something we had a hard time understanding. Then once our big day happened I was shocked (understatement) how beautiful and smooth it went! Azflowerbar had beautiful arraignments that exceeded expectations (obviously communicated by Trista and Alex since I gave some vague ideas). We loved our lighting vendor and the draping of our venue was beautiful. The songs we wanted played were played and our ceremony went off perfectly. It was not a stressful day and we were able to enjoy so much of it with everyone since we didn't need to worry about anything. 2 of our single guy friends even came us and mentioned how they couldn't wait to get married and wanted to throw such an awesome reception when they did....WHAT?!? Best parts: Vendor management & the big day. They found us an amazing dj. All our guests were so surprised that Aaron was so good and by the end of the night (6 hours later) 80% of our guests were still on the dance floor. There was not even one song that was played which made the dance floor clear. The makeup artist they recommended (Eric J) was INSANELY GOOD AND FAST. I was literally able to hang out poolside until 1:00pm with my friends and family and then was all ready for a first look at 2pm. My bridesmaids and both our moms started at 11am. I am elated to describe the professionalism and unending dedication to my daughter, her fiancé and myself as we hurdled through the months leading up to the wedding. I could not have ever possibly pulled everything together without Trista and Alex. First and foremost, Trista and Alex are professionals with an unending dedication that helped us hurdle through the months leading up to the wedding. It would have been next to impossible for me to ensure that everything was in place before, during and after the wedding without the guidance of BTS. I interviewed five wedding planners and I choose BTS because they are passionate, personable and they listened to my questions and needs. I liked knowing that they manage events and are not your typical wedding planners; they have extensive contacts and solid experience in the corporate world and understand business contracts and negotiations. Immediately after hiring Trista and Alex they stepped into help me with a vendor who had changed my contract and added items that were not up to par with BTS's standards. This saved me additional costs and valuable time. The recommendations they provided were reputable and solid. Each vendor was outstanding and they always went above and beyond my expectations. One vendor said he would move mountains for BTS clients because Trista and Alex value their vendors and they know their individual client needs. BTS is very knowledgeable, organized and most importantly are compassionate individuals who never stop answering questions, emails and/or phone calls. We are so very grateful to BTS for orchestrating a beautiful Wedding Ceremony, Cocktail Hour and Reception at the Royal Palms. I was amazed how much work went into the actual day of the wedding and am very thankful I left the details to BTS so that I could enjoy each second of my daughters Wedding Day - and yes, it was flawless. I highly recommend BTS without any hesitation.